DIY Pinafore Apron for Girls Free Pattern and Video Tutorial. 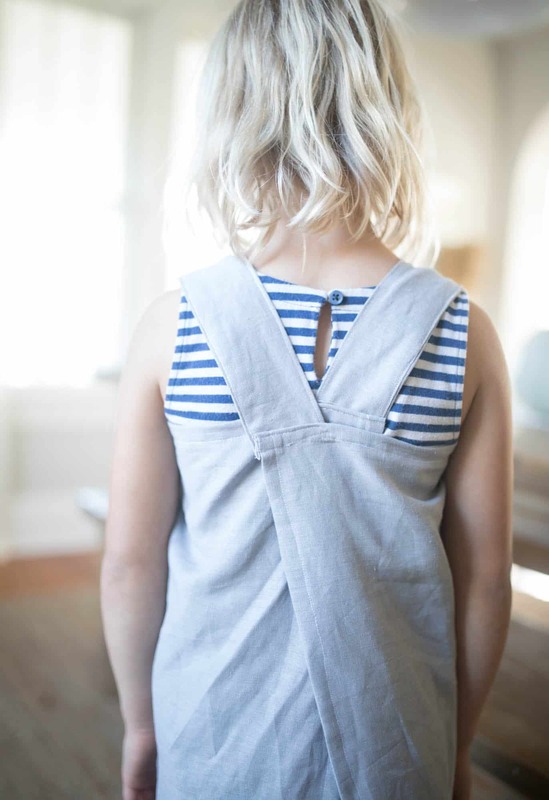 Learn how to sew a simple pinafore apron. 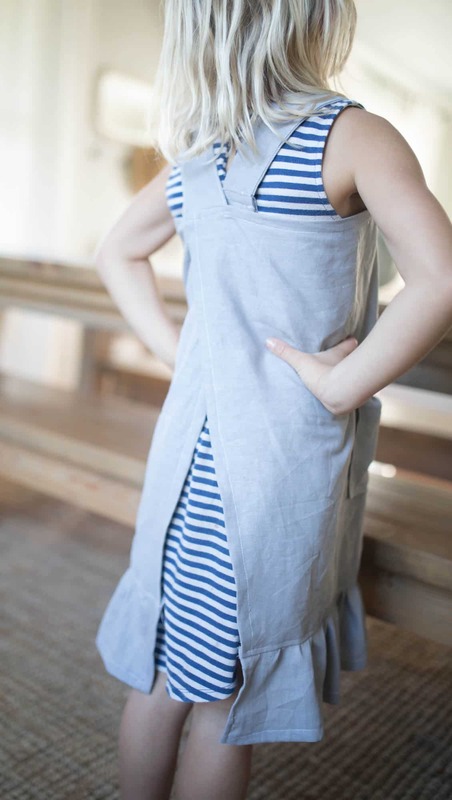 This DIY pinafore apron for girls is easy to sew. It comes together in about an hour. Linen has a beautiful, vintage texture and looks so perfect with farmhouse style. I love it in tea towels, pillow covers and clothing. I even made a DIY Linen and Flannel Ruffle Throw Blanket that I shared a tutorial for last winter. Now I want 500 yards of linen in every single color to make my girls’ entire wardrobes in it. To keep costs low, I used a linen blend for this project. Anything with 50-100% linen will work perfectly. 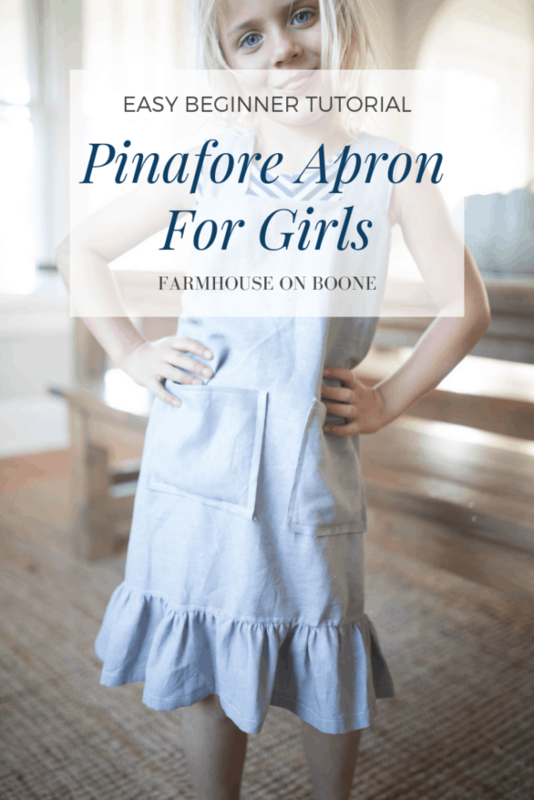 The video tutorial will give you everything you need to make a DIY Pinafore Apron, but if you’re more of a “see everything in print” person, I am including instructions here as well. Start by cutting out all the pieces from the cut list below. Everything is just squares and rectangles. I included size guidelines for ages two all the way up to 10. Fold the strap pieces in half right sides together, and sew a 1/4″ inch seam down the long edge. Turn the straps out and press them flat. Put a topstitch in close to the edges on both long sides. A topstitch is a stitch that is sewn close to the original seam. It is on top of the garment, or project, and visible when it is complete. Its purpose is to make a seam lay flat. Tale the large main apron piece, and press, along the sides and top, to the back about 1/2″ and then another 1/2″ to hide the raw edges inside. Don’t press the bottom. We will leave that raw to attach the ruffle to later. Place the strap pieces underneath the pressed area at the top, flush with the outside edges of the apron. Sew the straps in place. Cross the straps over each other, so they are criss cross. Pin the straps in place toward the middle of the front of the apron. Refer to the strap placing guide below to find out how far to pin the straps in from the outside edge of the main piece. For example, for the 4-6 size I pinned the straps 10.5″ from each outside edge. The straps ended up being 4.5″ apart in the front. This will be slightly different for each size, but I included all that in the guide below. Sew the front straps in place under the top pressed edge. Turn the strips up and sew all along the top. I know this sounds confusing, but it makes a lot more sense on the video! Press the edges of the square pocket pieces to the back on all four sides. Sew a seam along one of the sides. This will be the top of the pocket. Pin the pockets in place. Refer to the pocket placement guide below. Remember the part you already stitched will be the top of the pocket. If you are brand new to making ruffles, check out my video tutorial HERE. Hem one long edge of the ruffle piece. Add a gathering stitch to the other long edge. Pin the ruffle, with right sides together, to the bottom of the apron, and sew it in place. Finish the raw edges, where the ruffle joins with the apron, with a zigzag stitch or serger. Topstitch the ruffle to make it lay flat. Since there will always be a slight variation in size of seams and pattern cutting, use the following measurements as guides only. The pockets and straps should be centered on the apron. If you find that any part of my placing guide conflicts with that, just do your own measurements on the finished apron and make sure everything is centered and even. 28.5 The top of the pocket should be placed 6″ from the top of the apron. Place the outside edge of the pocket 6.5″ from the outside edge of the apron. Put the back straps in flush with the outside of the main apron piece. Place the outside edges of the front straps in 10″ from the outside of the apron. They should be 3.5″ apart in the front. The top of the pocket should be placed 8″ from the top of the apron. Place the outside edge of the pocket 8.5″ from the outside edge of the apron. Put the back straps in flush with the outside of the main apron piece. Place the outside edges of the front straps in 10.5″ from the outside of the apron. They should be 4.5″ apart in the front. 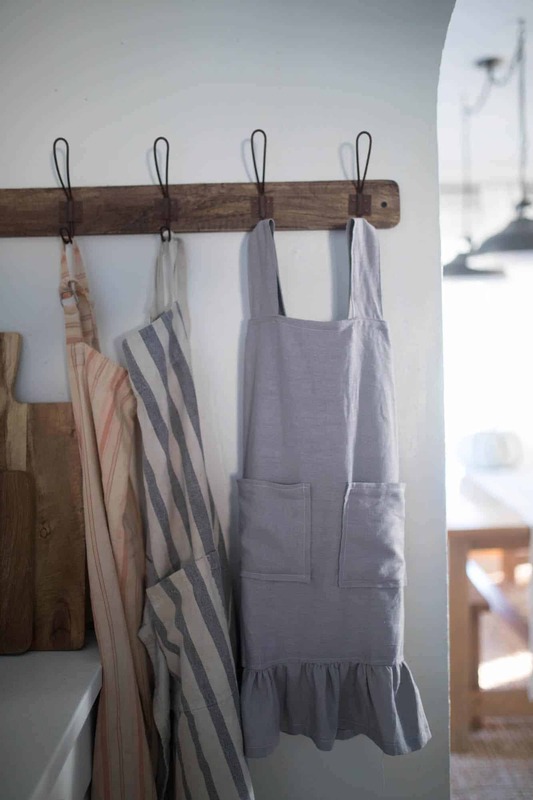 The top of the pocket should be placed 10″ from the top of the apron. Place the outside edge of the pocket 9.5″ from the outside edge of the apron. Put the back straps in flush with the outside of the main apron piece. Place the outside edges of the front straps in 10.75″ from the outside of the apron. They should be 5.5″ apart in the front. The top of the pocket should be placed 12″ from the top of the apron. Place the outside edge of the pocket 10.5″ from the outside edge of the apron. Put the back straps in flush with the outside of the main apron piece. Place the outside edges of the front straps in 11″ from the outside of the apron. They should be 6.5″ apart in the front. 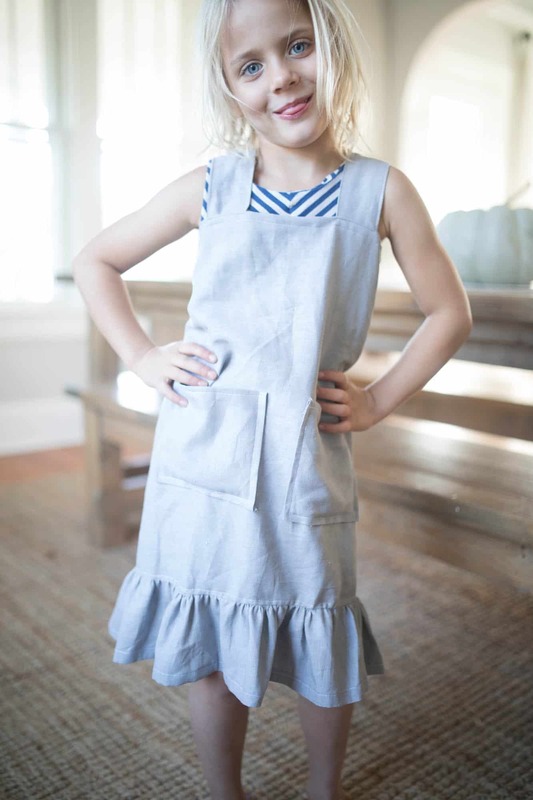 Enjoy making this simple DIY Pinafore Apron for Girls! This post contains affiliate links for your shopping convenience. See my full disclosure HERE. Do you have women apron lpattern? Love kid’s apron. I love this and can’t wait to make it. Do you have this in adults. I would love the info on this as well.